Need flooring that is durable and contemporary? Due to its practical and hygienic properties, rubber flooring is a popular choice for high-traffic areas, such as kitchens, playrooms, bathrooms and kids' bedrooms. Despite its tough image, it is soft to the touch and comfortable to walk on. Strong and resilient, if laid properly rubber flooring can last for 20 years or more, which is why it’s growing in popularity for homes. 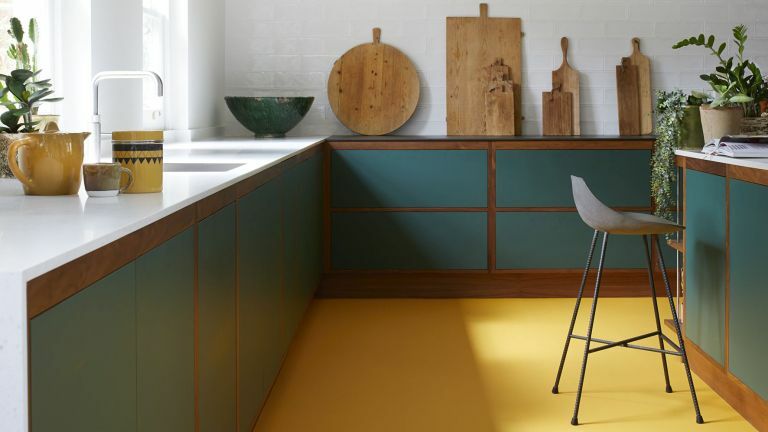 Here's how to choose the best rubber flooring for your home. You can buy rubber flooring from £30 to around £60 per square metre, but expect to pay a little more for bespoke orders. What is rubber flooring made from? Today, most rubber flooring is made from synthetic styrene-butadiene rubber (SBR), a by-product of crude oil. Natural rubber flooring, made from latex, is also available, along with a few small suppliers of recycled rubber. If looking for a sustainable material, check with your supplier, as natural rubber is a wholly renewable raw material. If you are unsure of its credentials, ask for evidence of its content. Some companies also offer a bespoke colour service. Like other types of flooring, rubber has its pros and cons. The main advantages of this type flooring are that it's cost effective, warm an soft underfoot, and long-lasting. You may also want to consider this type of flooring if you are an allergy sufferer, since is it is very hygienic. The disadvantages of using rubber as a flooring material are that it is prone to getting scratched and stained, and that it can become slippery, which is something to consider when laying it in bathrooms and kitchens. Where to lay rubber flooring? It’s ideal for potentially wet areas such as kitchens, bathrooms and utility rooms because it is hygienic and easy to clean. It is becoming increasingly popular for lived in areas too, especially in contemporary homes. If you are using it in a living room or bedroom, make sure you lay a protective pad rug under any furniture to avoid marking the floor. Some types of rubber flooring are designed for outdoor use in spaces such as children’s play areas, while other lower-grade versions are designed for garages, sheds and workshops. Is rubber flooring suitable for underfloor heating? Rubber flooring is an obvious option for pairing with underfloor heating because of its soft and warm surface. It can hold heat very well and is great choice for bedrooms and bathrooms, where you might be walking barefoot. If you do wish to install underfloor heating beneath your rubber flooring, check with your supplier to see if it has a maximum heat restriction before installation, to make sure the heat won’t damage your chosen flooring. This will depend on your level of skill and experience. Tiles are easier to lay than sheet flooring (just check out our step by step guide to tiling a floor) – cutting it incorrectly can be a costly mistake. If you require a more professional finish, or have a large area to fit, consider employing the services of a qualified or experienced fitter. If you do decide to fit it yourself, ensure your subfloor is level and smooth. There may be slight colour variation between batches, so always order the required amount in one go and use the manufacturer’s recommended adhesive. Most tiles that are suitable for domestic use don’t require seam-sealing; this is usually something that is done within commercial settings with specific hygiene requirements, such as in hospitals and laboratories. Where to find a reputable rubber flooring fitter? Ask your supplier if they provide a fitting service or if they can recommend local tradespeople for the job. Most suppliers will offer a fitting service because of the specialist nature of the product. However, personal recommendations are often the best option. Alternatively, search websites such as Rated People and Check a Trade for local fitters. The National Institute of Carpet and Floorlayers can also provide you with a list of members. Rubber flooring doesn’t require specialist cleaning. Simply remove loose dust and dirt with a broom or vacuum cleaner and clean with a damp mop using the detergent recommended by the manufacturer. Some types of rubber flooring can be polished to give a glossy finish. Always use mats by external doors, and fit protective feet or pads to the bottom of furniture to prevent marks. Avoid damage from kitchen appliances by placing a sheet of hardboard between the appliance and floor, and don’t drag heavy objects or furniture across a floor without any protection. All floor coverings can be affected by direct sunlight and can be prone to colour fading, so consider keeping blinds closed on sunny days where possible, especially if you opt for a bold or dark shade. Tempted by the solidity of real stone instead? Which wooden flooring is best for kitchens?